YOU MAY ALSO LIKE...: Oooooh, Thports! The most practical and useful gift to give to any die-hard NFL sports enthusiast. This three-piece rectangular plastic food container set features silicone rubber lids with clear see thru side walls. Your favorite teams logo decal sticker is centered on the top of each lid. 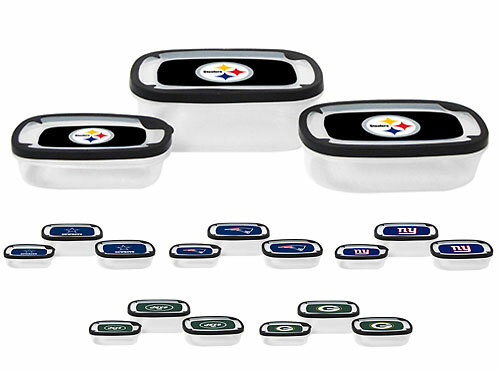 Choose from 6 available teams: Steelers, Cowboys, Patriots, Giants, Jets, and Packers. Can be used to store food, or other items such as craft necessities, kids pens/pencils, or other odds and ends. Includes three sizes: Large: 9-1/4" x 6-1/4" x 3-1/4"; Medium: 8-1/4" x 5-1/2" x 2-1/2"; Small: 6-3/4" x 4-1/2" x 2". Lid is not safe for dishwasher or microwave - remove from bottom before heating. BFA Free. Finally, now the men can play along when their wives are selling Tupperware.